Heart valves play an important role in the function of the normal heart; they prevent blood from flowing backwards and maintain the overall flow of circulation. The human body has a double circulation system. Blood flows from the left side of the heart and around the body and back and then flows from the heart to the lungs and back in a shorter circuit that starts at the right side of the heart. This ensures that the body receives a regular supply of oxygenated blood to keep all the tissues and organs able to burn glucose for fuel to power all their metabolic processes. The main heart valves are the main aortic valve, which prevents back flow of blood from the left atrium of the heart into the left ventricle, the aortic valve, which prevents back flow from the aorta into the left ventricle. On the right side of the heart, the tricuspid valve stops blood flowing backwards from the right atrium into the right ventricle and the pulmonary valve stops blood flowing back from the vena cava, the main artery that leads to the lungs, back into the right atrium. Heart valve problems can develop for several reasons – age, disease, infection or because of a congenital heart defect that becomes worse over time. A faulty heart valve can be quite serious as blood can leak through and the circulation is compromised. The symptoms caused vary depending on which heart valve is affected but the usual effect is that heart failure develops. If the right side of the heart is affected, fluid builds up in the legs, ankles and feet and can also form in the abdomen. If the left side of the heart is affected, breathlessness is the most common symptom. All of the different valves in the heart can be replaced but the choice of prosthetic valve depends in a surgeon’s preference, experience and on the individual patient. Animal tissue valves or a human heart valve obtained from an organ donor are used as biological heart valve replacements. These work well but care must be taken to avoid rejection of the new tissue, as the body sees it as ‘foreign’ and sets up an immune response to destroy it. Rejection can be minimised by pre-treating the replacement valve, and by suppressing the immune response in the person receiving the new valve. Artificial valves are another alternative and medical technology has designed very effective replacement valves, many of which will outlast the person they are implanted into. The carry the risk that blood clots are more likely to form around the artificial materials used to make the valves, but there is far less risk of rejection as inert materials are used that do not provoke an immune response. The factor that is most often used to make the decision of whether to implant a biological heart valve or a synthetic one is the age of the person with the valve problem. Tissue valves tend to only last 10-15 years, so are only really suitable for elderly people with valve disease. Someone in their 40s or 50s would normally be given a mechanical artificial valve as this should last their lifetime. Even if they were to live another 50 years, it is unlikely they would ever need the valve replacing again. Some heart valve problems can be addressed by an operation that repairs the valve rather than replaces it with a biological or a synthetic alternative. The operation is very intricate and, like all heart valve surgery, involves an open heart procedure in which the normal function of the heart and lungs is taken over temporarily by a heart and lung machine. In some ways, a heart valve repair is preferred as there is no introduction of foreign tissue into the body; if the body’s own valve can be restructured so that it functions normally, the outcome is usually very good. Most heart valve repair surgery is currently done on the mitral valve. New techniques are currently being researched to develop less invasive methods of repairing heart valves. It is already possible to use tiny instruments that can be introduced into the heart through one of the main veins in the leg. 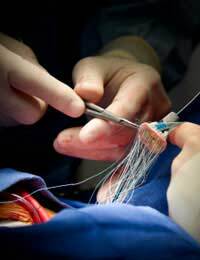 This remote surgery needs very skilled surgeons and does carry risks. If it can be perfected, however, it would remove the need for the heart and lung machine and for such a drastic open-heart operation.